"Grandma's: My Bucket List Race!" As a lifelong Minnesotan, Grandma's Marathon has been sitting on my bucket list for quite a while and, finally, I was able to make it there this year. It just so happened to be the PERFECT year to race there with amazing weather and storms in the forecast that never showed! Registration: For registering online before January 1st, I received a high quality, zip-up Grandma's Marathon training jacket. This was the perfect motivator to get me through those cold Minnesota winter training runs. Expo: I wasn't able to make it to the expo on Friday for packet pickup but opted to have my packet mailed to me instead. For $25 my packet was mailed to my doorstep a week or two before race day. That was so helpful as we have small children and quite a way to travel that day. Race Swag: The training jacket for early registrants was definitely some “bonus swag”! Along with the amazing race medal (more on that below), the marathoners received nice quality dark green “finisher’s shirts” upon completing the race. Course: This is the highest point of Grandma’s Marathon. I absolutely LOVED the course! The first half of the course is mainly scenic rolling highway lined with trees and an overlook of Lake Superior in spots. Race morning was cool this year and a mist covered the lake. It was really refreshing to run through! The next half of the race was moved into the more spectator-filled areas as we neared Duluth. We ran by the Glensheen Mansion and the “Troll Mile” was really cool too. The spectators were wonderful and I enjoyed their enthusiasm and the rolling hills. There was never a dull moment in this race. Finishing down a road lined with cheering fans was so awesome! The energy was high and the noise grew as we neared the finish. Upon finishing the race, the finish area was also quite scenic. It’s just such a beautiful area. Aid Stations: The aid stations are located on the odd number miles up to mile 20, where they increased to being every mile. Stations offered water and Powerade with a selection of gels (numerous flavors!) available at mile 17. Occasionally there were bananas or oranges being handed out too. Awards: The race medal is beautifully designed and a perfect fit for the race. Plus, it’s free-standing and easy to display. Post-Race Refreshments: Water bottles were given out immediately after crossing the finish and the post-race refreshment table offered potato chips, CLIF bars, strawberries, orange juice and more. A drink of choice was available in the finisher’s tent when runners presented their designated ticket. Logistics: Smooth! I was nervous about navigating a bigger race like Grandma’s Marathon but the shuttles made it a breeze. We decided to stay at the AmericInn in Carlton (about 20 minutes away) to save on hotel cost. They didn’t have a shuttle leaving from that location on race day but my husband dropped me off at the Proctor AmericInn to board that shuttle. A return bus brought me back after the race as well. Overall that plan went smoothly and taking the shuttle was much easier than finding parking in all the busyness of the day! Grandma’s Marathon was an absolutely AMAZING experience! It may be my new favorite race and I can’t wait to go back. "Frozen Feat 10k: New race swag this year!" 2018 was the 11th year that runners have lined up to conquer the cold in the Frozen Feat 5k/10k. Weather in the northern Midwest's winter is a gamble and, unlike the previous weekend with a -12°F windchill at the peak of the day, race day showed up as a sunny +18°F! This was my second year running the race and it is becoming my favorite way to break up the cold months and kick off training for spring races. Registration: I registered online in December for the Frozen Feat 10k (a February race). Just before a price increase, registration was $30 and very reasonable for a 10k of this quality. Expo: There isn't an official expo for this race but packet pick-up was available on Friday evening and on race morning. I pre-registered and picked up my number with ease on the morning of the race. They had booths set up for pre-registered runners and those registering that morning. I made it to pick-up at 9:00 am, took maybe 5 minutes to pick up my packet and then prepped for the race start at 9:30! Race Swag: The race swag got even better than last year! 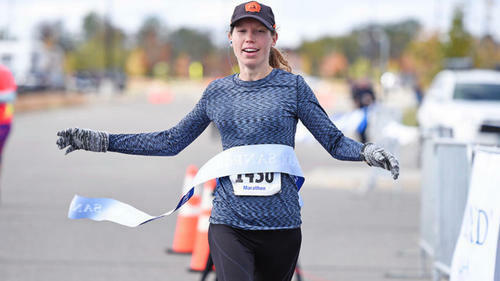 Along with a race number, a pen and some local business discounts, each runner received a hooded long-sleeve shirt with the race logo and a comfy pair of Frozen Feat Fitsoks (new this year!) in their race bag. I was very excited to add another pair to my Fitsok collection! Course: The course consisted of a small stretch of street and then it was mostly a running/bike path. The 10k and 5k runners had a slightly different race route (~288 runners total). There were no traffic issues with vehicles or congested runner traffic. Aid Stations: There was one station with water for the 10k around mile 4 or 5. That was plenty for this race distance. Awards: The snowflake design this year is beautiful and all runners received a medal after crossing the finish. With the 10k starting at 9:30 am, runners were able to grab post-race refreshments and relax while listening for their Bib # to win a door prize. The awards started at 11:00 am. The Top 3 Male & Female runners and Top AG'ers received Frozen Feat mugs. Top 3 Males/Females also received plaques and a Scheels gift card. Post-Race Refreshments: There were tables lined with huge doughnuts, beer cheese soup with popcorn (and possibly chili, too? ), hot chocolate, coffee, bananas and bottled water for runners to enjoy. The Frozen Feat really rocked the post-race refreshments this year! Logistics: This race is very well organized! We found 2-hour parking a couple blocks away last year but this year there was public parking ramp access just across the road. The race informed all participants of that before race day and it made everything go smoothly on race morning. The Frozen Feat was a great experience once again this year and I hope to make it there as a yearly tradition! "Hot Chocolate 15k - Making the Best of a Rainy Race Day"
The Hot Chocolate 5k/15k Minneapolis took place on April 15, 2017 at Boom Island Park. The weather on race day proved to be a rainy one in the 60's and thankfully the rain let up near the end of the morning. This was my first experience running the Hot Chocolate race series and my second time racing in the Twin Cities area. Expo/Packet Pick Up: My family and I drove 5.5 hours to the race on Friday (4/14) and thanks to the packet mailing option, we didn't have to worry about making it to the expo on time. No packet pick up was allowed on race day. Packet mailing was a lifesaver for me and, for only a $15 additional cost, my race packet arrived about a week prior to race day. It was worth it for us. Race Day: I walked to the race from the Westin Hotel (about 1.5 miles from Boom Island Park) and the rain was coming down, not a torrential downpour, but enough to thoroughly soak and allow for plenty of puddles. I walked with three 5k runners and the walk over felt safe and was actually fun, minus the rain. Upon arriving to the race, we all checked our gear right away and the process was very smooth. The gear check and the porta potties were not crowded and waiting in lines wasn't an issue. Boom Island Park was a beautiful area but the rain that morning had well-saturated the grass, making it impossible to stay dry. The 5k'ers started at 8:10 and 15k'ers were set to start at 8:50. By the time I headed to my race corral, I had accepted that being soaked was inevitable! At the starting line, the runners were lined up according to the corrals noted their race bibs. Line up went smoothly and, aside from the soaking rain, waiting for the start was enjoyable. After some conversation and the national anthem, it was go time! The course was an out-and-back with a decent amount of hills. We ran beside the river and I thought the view was quite scenic - a nice way to explore the city. There were some puddles to dodge but that you can blame that on the weather! Aid Stations: There were plenty of aid stations offering water and Nuun. I was disappointed that there were no "sweet stations" with candy along the way. I was looking forward to those! Post-Race: After crossing the finish, we received our medals immediately and continued on to the finisher's area. The Hot Chocolate medals are VERY nice quality and I like the design. Each runner had a voucher for a finisher's plastic "mug" full of treats after the race. The mug included delicious hot chocolate, a banana, apples, pretzels, cookies, marshmallows and a Rice Krispie to dip in a chocolate sauce and a wet wipe for clean up. It was SO good (and messy)! Hanging out after the race would have been fun if the weather was more favorable. Two fellow Bibrave Pro's and I took a picture in front of a blow-up Hot Chocolate mug & marshmallows. With more pleasant weather, I would have enjoyed hanging out at the park with my family and letting the kids play on the playground. It was a beautiful place to have a race and the open grassy area would have been perfect for picnics or what-not after the race. 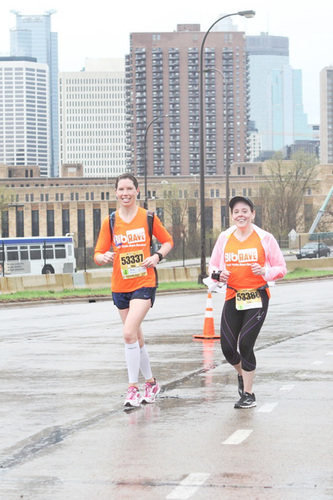 One huge perk of this race is that they take FREE race photos and then send them to your email post-race. I was thankful to have pictures from the race, especially since my family didn't come with to cheer me on in the rain - not to say I blame them! Logistics: Parking was said to be hard to find at this race, so we opted to stay at the Westin Hotel in downtown Minneapolis so I could walk to and from the race (1.5 miles each way). This approach worked though we may opt for a different hotel and ride the light rail or something next time. The Westin was gorgeous and it did have a pool for the kiddos though they didn't offer continental breakfast (bummer!). Overall, dealing with the traffic downtown and finding public parking was a zoo and I would rather stay farther away from the race site next time and use Uber or the light rail to get there. 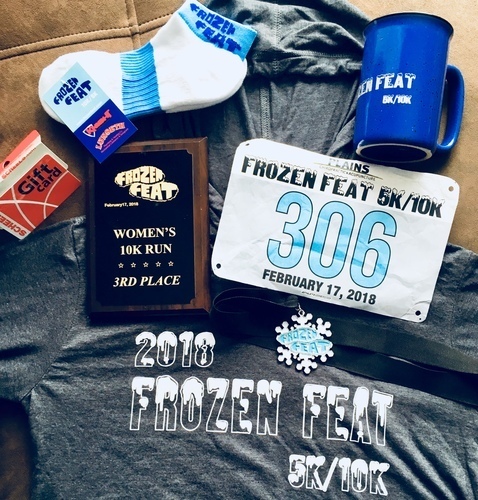 "Frozen Feat: An Awesome Mid-Winter Challenge"
The Frozen Feat 5k/10k is a great excuse to break up the monotonous winter weather in these northern parts. So maybe it sounds a little crazy to run here in February but the unpredictable winter weather is half the fun. While previous years have been ridiculously cold (so I heard), my first year of running the Frozen Feat 10k was a gorgeous 40 degrees above zero! The only downside to the heat wave was the ice and icy puddles from the melting snow. That made racing more interesting but racing in North Dakota's February guarantees an interesting experience. Expo: There wasn't an official race expo but packet pick-up was available on Friday evening and on race morning. I had pre-registered and picking up my number that morning was a breeze. They had booths set up and were very organized. Race Swag: AWESOME! The medals feature the Frozen Feat logo and are very unique. My favorite swag item was the 3/4 sleeve jersey shirt this year. It was a nice change from typical technical race shirts and is very cozy - quite fitting for the real winter weather that is sure to return. Course: The course consisted of a small stretch of street and then it was mostly a running/bike path. I appreciated that because vehicle traffic wasn't an issue at all. The only downside was the batches of ice and icy slush puddles - thankfully the course has only a few slight rolling hills and I didn't see any major wipe outs. The 10k was very slippery but I heard it wasn't so bad for the 5k'ers. They also released the 10k group 30 minutes before the 5k group and that prevented clogging up the course. With around 260 runners participating, this was a very wise decision made by the race directors and it paid off! Aid Stations: I saw one aid station that offered water and did take a cup "to-go". Being it's a shorter race, having one station with water was plenty. Medal: Very nice and uniquely designed! 10k medals were blue and 5k medals were green. The Top 3 Male & Female runners and Top AG'ers were given special Frozen Feat mugs. The Top 3 Males/Females also received plaques and a Scheels gift card. Logistics: Parking was fairly easy to find and my husband only had to move our car out of the 2-hour parking once. Very uncomplicated logistically! "Improved Full Marathon Course & Gorgeous Fall Leaves"
Since the last time I ran the Blue Ox full marathon in 2013, the organizers have re-routed the first 8 or so miles of the race to go through downtown instead of on a country highway. This was awesome! I enjoyed the change of scenery and looking at all of the downtown businesses as we ran by. Expo: I picked up my packed the morning of the race and missed out on most of the race expo. In the morning packet pick-up, my kids did get foam "horns" for Babe the Blue Ox and a foam "beard" for Paul Bunyan, along with cheering pom-poms, moraccas and blow-up axes. They had a ton of goodies for my family and I! Race Swag: The full marathon participants received a long-sleeve technical shirt and I loved their "Harness Your Inner Ox" design for this year. Course: Along with the course change I mentioned above, the Blue Ox course was beautiful with the changing fall leaves. The course has rolling hills, especially some big ones from miles 20-25, making for a challenge on tired legs. I really enjoyed taking in all of the Fall leaves changing colors along the routes through the state park and alongside the college campus. Aid Stations: The aid stations seemed further apart this race but I think it's also because I just ran a marathon two weeks ago with super close aid stations (Grand Forks). They offered sports drinks and water at each station along with two stations of GU's. The Salted Caramel GU's are my new favorite!!! Medal: I love the medals this year! The medal "lanyard" was a piece of blue plaid wool material from the Woolen Mill in that town. Loved their design. For coming in as first Female, I received a full-sized ax with the logo and text "burnt" into the wood. It's HEAVY but a super cool award. Logistics: Parking was a breeze and my family had a great time watching me from numerous spots along the course.